You probably read the title and said "what the..? 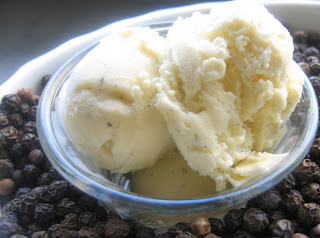 Black pepper in ice cream?" Sure, why not!? Continuing on my ice cream infatuation, it's gettin' a little crazy here. This is classic mix of spicy meets sweet, and it works quite well. Of course you can overdo it the pepper here, so do be careful to not take it too far. 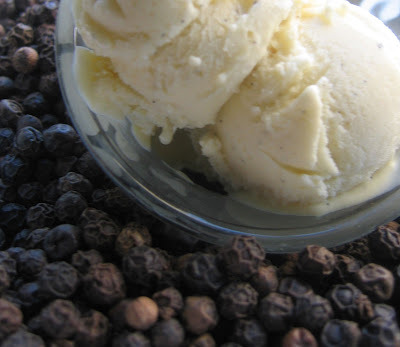 I think what might be harder to imagine is what to serve the black pepper ice cream with. It can stand on its own as just a small scoop, served with say a chocolate martini. When pairing this ice cream, it needs to be a simple item - like a pound cake (try grilling it!) or a very simple dense chocolate cake would work well. I also think that it would blend well with a cherry pie. This is going to be an adult ice cream rather than one for the kids. Serve it at your next dinner party as just scoops on spoon. It will be a great conversation getter and you'll be looking fat and happy! Add the cream, vanilla bean, milk and pinch of salt in a pot. For the vanilla bean, you will need to split the bean in half and scrape out the paste-like inside. Add this to the milk along with the bean casings and the black pepper. Bring just to below a boil, turn off heat, place a cover on and let steep for about 15 minutes. Then whisk together the yolks and sugar until the yolks turn a fluffy pale yellow (this is going take about 5 or 6 minutes, just keep whisking! You're building muscle!) Now, temper the eggs by add a cup of the warm cream to the eggs, one at a time. You're bringing the eggs up the the temperature of the cream slowly to avoid scrambling the eggs. Now cool the cream by placing in bowl (or simply use the pan its in) and then place that in a larger bowl of ice and water to cool. Stir often. As I always say, if you need to make the ice cream immediately, add it to your ice cream machine and follow the manufacturers instructions. If you can wait a day, place the custard mixture in the refrigerator for the night, and then continue with your ice cream machine after that, using the manufacturers directions. Allowing the cream mixture to sit overnight helps the ice cream to become slightly smoother and creamier! Enjoy! Wow - this looks really really good! I'm glad I found your blog! Very good resource for detailed recipes!